Slots Capital Casino’s heavenly new Almighty Dollar slot game from Rival Gaming is a divine 3-reel slot with free spins and win multipliers. The casino, which specializes in unique online slot games, is giving players 20 free spins, 70 more free spins and then another 100 free spins. Slots Capital Casino ’s heavenly new Almighty Dollar slot game from Rival Gaming is a divine 3-reel slot with free spins and win multipliers. The casino, which specializes in unique online slot games, is giving players 20 free spins, 70 more free spins and then another 100 free spins. Floating above mankind in the soft clouds, two angels shine down their good fortunes with a winged lion standing guard. Halos, trumpets, harps, and divine 7s also spin on the new game’s reels. There’s also a 3X Wild symbol that triples wins and a Free Spins symbol that triggers bonus spins. Two Free Spin icons trigger 7 free spins; 3 wins 21 free spins. Available September 13-15, 2018 only. 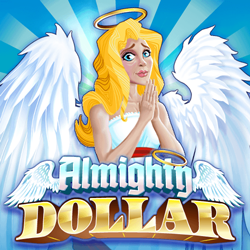 The new Almighty Dollar is now available in Slots Capital’s download, instant play and mobile casino games. Slots Capital is a full-featured online casino offering hundreds of unique online slots and table games from Rival Gaming. The casino welcomes new players from around the world with a 277% Welcome Bonus – up to $2777 in free casino chips.